In the past few years, left leaning leaders from around the globe have been keen to tackle climate change. Pope Francis wrote a bull Laudato Si urging world leaders to come to terms together in the Paris Climate Change Agreement. They sought to sign the Paris Climate Change Agreement with great fanfare, but on the eve of the Summit, the multiple Paris attacks occurred drawing attention away from the achievement. Now that it has come time to implement the Paris Climate Change Agreement, skeptical environmentalists question the efficaciousness of the accord. But dissent is not something that progressive politicans or the press can fathom.Senator Ted Cruz stumped Sierra Club President Aaron Mair in testimony to account for Climate Change considering the 17 year lull in warming. French Mathematicians were deemed to be dolts when then point out the absurd cost of prospective compliance with COP 21 promises. 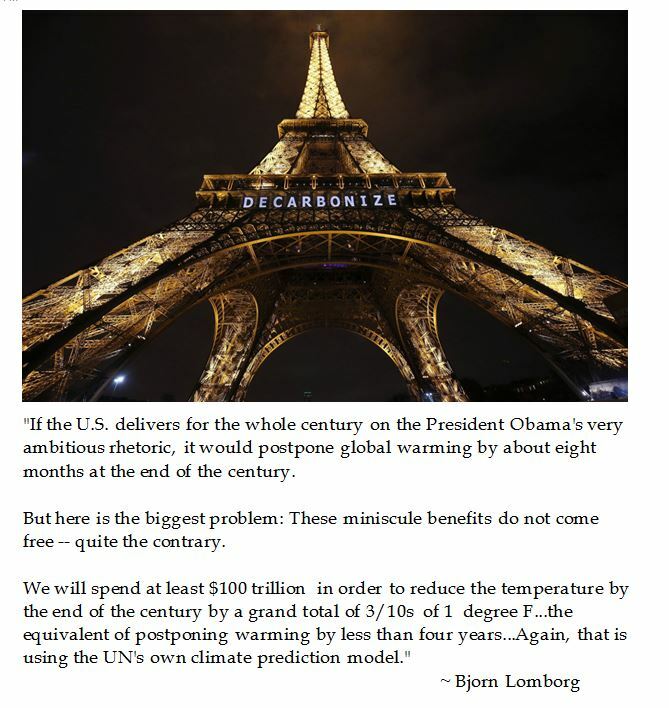 The Skeptical Environmentalist, Bjorn Lomborg, accepts the fact the global temperatures are rising but postulates that the Paris Accords are more about Climate Aid than really solving the problem of Climate Change. Science is supposed to be about facts and informed inquiry. But that is not how Climate Change advocates evangelize as they attack apostates who question if it is settled science. Sean Penn has suggested shaming Climate Change deniers . A French weatherman was pulled off the air for not spouting the liberal party line about climate change. Sadly, those steeped in Climate Change politics are reluctant to engage in cost benefit analysis much less critical appraisals of the proposals, as they implore that "something must be done" and will hear nothing else.